Two basic typological point types are represented in the Horner II site excavation. All but one example are type I style points. This is the single type II point that was found during the excavation of the Horner site and it's been identified as an Eden style. It falls typologically and technologically between the Alberta and Scottsbluff / Eden points but is considered to be an Eden style. The flaking is the reason for its type II designation and the decision to call it an Eden point. Flakes were removed wide enough so they do not overlap and they were removed uniformly. It's described as being generally narrower than type one points and the blade edges are less convex. The point is widest at the shoulders and the thickest area is near the point (distal end). The cross-section of the blade is lenticular and the cross-section of the stem is flat. This point represents one of 21 projectile points that were found during the University of Wyoming excavations and only one of five complete un-reworked points. 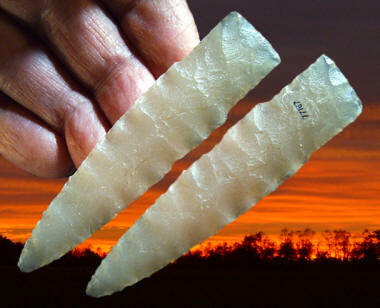 This point is made of translucent Morrison Formation chert and measures slightly over 3 3/8 inches (8.6 cm) long. This projectile point was discovered sometime during the 1977-78, 1980, 1983 & 1984 excavations of the Horner II site by the University of Wyoming. Earlier excavations of the Horner site (Horner I) was carried out by Princeton University in 1949 & 1950 and by the Smithsonian Institution in 1952.